This blog is rapidly (or not!) just becoming a Quarterly feature isn't it?! Can't be helped of course and certainly isn't aided by opportunity to surf here in the east..for me personally at least I did actually venture back over to Sandilands early in March iirc, but the session and conditions were so poor for a variety of reasons, that I just didn't bother posting details. The rot though did look set to be rectified when Suz and me got ourselves sorted for a week at Gwithian after Easter. And so; on the whole it ultimately transpired. When a re-arranged Pirates fixture with Doncaster created a chance to see the last two home games of the season on consecutive weekends, we set in motion arrangements to make a week and bit of it. The emphasis would primarily be the surfing in unison with the rugby and so we decided to head back to Gwithian/Godrevy for the first time as a base since 2000. We found ourselves a one bed chalet on the Towans and then waited the few weeks after booking to contemplate our first holiday alone; without Boy or Dog, for over 18 years! Weird or what!? We also sorted some B&B accommodation at either end of the week to extend our stay to firstly break up the journey down at Cullumpton; and also allow a post rugby night out in PZ with 'Welsh' mates Dave and his sis, Jen, before returning to Lincs yesterday; Sun 26th. After more than adequate refuelling breakfast wise we were back on the road the following morning and stroked the last 100 or so miles to be parked up outside the Annexe a little after midday on Sat 18th. The weather too had cheered up as forecast, seemingly doing so on cue as parked up Boris ready to unload all our stuff. Was this a sign? Could have been of course for all I knew as I'd taken little note of what the surf prospects had been, other than a cursory glance at Souls forecast prior to leaving 24 hours earlier. Not that it mattered of course as our location made eyeball checks as easy as you need, overlooking Gwithian beach as we did across towards Godrevy. First look showed a clean if small wave beckoning to shake off any cobwebs asap; something which would follow after settling in and some light refreshment. By 3pm I'd whacked on the old and rapidly dying Snugg 4-3 and was paddling out to try my luck. Despite the easy conditions I did take longer than I'd like to get up to speed and felt well off the pace for 20-30 minutes. Things gradually fell into place of sorts and for the next hour I managed to hook into more and more waves, a dozen or so of which would 'tick the box' in cringingly management like speak. Keen not to spoil the moment and end on a high, I rode the last of these in with every intent on getting in again early the following morning prior to heading into Camborne for the Donny game. Suz and me also had dinner to sort as well as sussing the bus stop arrangements-so allowing for 'pop' and not having to drive. Amazingly I was up and 'at-em' before 7 and heading out for a surfcheck into the fog that gave promise of the forecast fine day ahead. It was eery it has to be said as visibility was down to less than a 100m with only the sound of the sea to remind me that it was only yards from where I set off. It was lifting quickly though and when the waves became visual it was clear that although still small there was at least at little more substance to them. And so it proved as I returned to the chalet to find Suz also up and ready to come and watch my efforts. Encouragingly these bore a little more fruit so to speak if still not exactly setting the world alight. Consequently the hour and a half or so produced more in the way of good technique even if the wave count was still below par. Hardly surprising given the continuing inconsistency in time available for my surfing, but still something to work on compared to September last which was just as afflicted. Could this be my missing a certain young surfing companion to rub off with perhaps? Ignoring the final result, the rugby was a blast and having stayed on till the last Suz and me eventually headed to the Red River Inn to round off a perfect day; and contemplate a week predominantly focused on water time. Trips to PZ on Tuesday and St Ives on Thursday excepted even though both wouldn't put a stop to eventual surf sess's on the same days. Monday produced for me the most satisfying times as a good morning surf was followed by an even better one in the evening as the swell continued to build nicely to head high plus. The wave count could have still been better but then by the time I 'bodyboarded' in a little before 8pm, the emphasis was definitely on quality rather than quantity. It would be easy to be too self critical, as the lineup particularly at the Godrevy end of the beach continued to be really busy (as it was on each evening that followed), but my wave selection and take-off do need attention as too many potential rides were missed. That said, any disappointment I may have felt (or was to feel later on in the week) was more than adequately covered by the stoke I felt with the overall experience I'd just had and the pleasure the waves I'd bagged had given. In particular I couldn't help but feel good with the general mellow ambiance in what was by it's very nature a competitive lineup. A point personified when pulling into another right and finding myself riding in tandem with another longboarder whose thumbs up and grin signalled the OK to continue on my way. 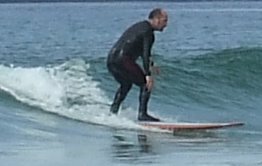 Note too the other young logrider whose ability to knee paddle into any given wave with the minimum of effort compared with some of mine.....reminds me of a certain upstart between 05-07! By the time we returned from Zance on Tuesday afternoon, Suz and me were both now in a routine that could have been sustained ad infinitum given the chance! I was tending to get in twice a day whilst Suz made it an every other day thing. The swell too according to overheard word in the lineup, looked set to continue with another larger pulse for Friday which if it matched that of the previous day would be an ideal opportunity to finish on a high surf wise. As it turned out, the swell had if anything picked up a little by the time I headed down the dunes on Tuesday evening; if not in actual size, then certainly in intensity. It certainly explained a more challenging paddle out, but I did at least get things wired once out back and enjoyed some exhilarating stuff before getting caught inside once too often and deciding to quit while ahead once again after another 90 mins or thereabouts. Wednesday produced a day of complete opposites as the swell continued to grow. My attempts in the morning were a complete shambles as I failed to break through and register anything of note. Consequently I followed soon after Suz's departure back to the chalet completely whooped and in barely half an hour. Most unlike me but at least the walk over Godrevy Point and the chance to admire the small colony of seals more than restored any loss in spirit. The hot choc at the Sunset Cafe also did it's bit and I decided to try and restore confidence by going back in in the evening. The paddle out did it's utmost to put me off but 15-20 minutes of dogged persistence eventually paid off. Barely an hour later and with half a dozen roller coaster rides had been enough in another busy lineup to put the smile back on my face. Which was just as well as things were only going to get even harder. That was put right the next evening after another day of relative struggle as the swell had grown to very heavy proportions. The morning had only produced one notable ride but I psyched myself up sufficiently for one final bash as the breeze that had been forecast to increase actually dropped off as the afternoon wore on. It didn't take much to convince me that Godrevy was just too heavy for me to find a way out and so I relocated south of the Lifeguards hut at Gwithian, where the next stepway makes it's way down south of Peters Point. The swell was still there but it was a lot cleaner and promised an easier paddle out. With two or three other longboarders out I took my chance for three quarters of an hour as the sets kept rolling in. I managed to paddle out without any major hurdles but just couldn't get into anything that came my way. This thing about the take off now glaring me in the face. Whether its a confidence thing to put in that extra stroke or two when it seems the wave has overtaken I don't know. I'll just have to work that out once again. Either way, as I tried desperately to rectify things I gradually moved my self towards a potential impact zone for the larger sets and left myself little option but to go for one that started to break over me. Surfing the initial turmoil in the white stuff I did actually get to feet and rode it in less than pleased with my efforts. Enter GR and a chance for a brief chat before he went out on his stand up paddle board. Not the ideal signing off then and perhaps summed up the subsequent foul and violent weather that followed. A real reminder of Boscastle back in 04 for sure. Then came the Pirates last match of the season defeat to London Welsh; the drenching I got after that and a missed opportunity for a night out at the Benbow. At least the company was good anyhow and our final nights stay at Torwood House a pleasant one. Just as well because the journey back the following day was as long and slow and subdued as ever.